Wood document frame with glass front and back to complete the fashionable float style. Four motivational 5x7 prints with quotations. Includes a removable two-way easel back with hangers for versatile desktop or wall display. DAX President's Collection Floating Frame with Motivational Prints - Liven up the office walls or the cubicle desk with inspirational prints and quotations. 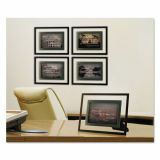 Black float frame with pewter accent includes a versatile, removable two-way easel for easy desktop or wall display. 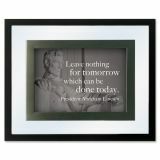 Four quotations with beautiful prints included with each frame. Door backs with turn-tabs for easy in-and-out assembly. "A man may die, nations may rise and fall, but an idea lives forever." "The only man who never makes a mistake is the man who never does anything." "America is too great for small dreams." "There are many ways of going forward, but only one way of standing still."